We are pleased to announce the introduction of My Work widget. 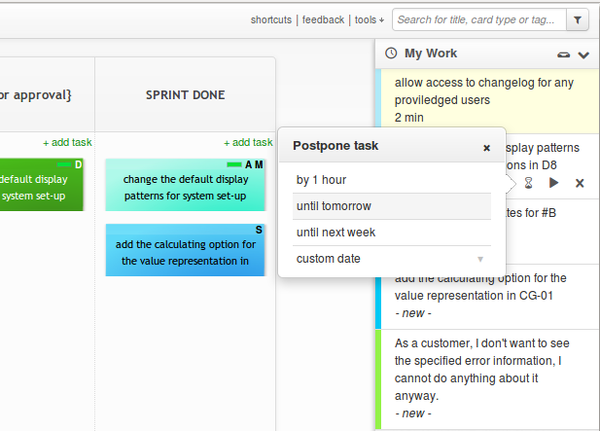 This is the one, that all Kanban Tool users, and our CEO especially, have been impatiently waiting for. But here it is now! Kanban Tool is all about managing your work and My Work widget will help you organize it further still. Together with Time Tracking, this is what enables you to meticulously plan and manage your work for a day or a week. Regardless of how many Kanban boards you have, in My Work widget you can display the tasks that you plan to do next, sort them with accordance to your preferences (prioritize) and even postpone for a set amount of time (x hours / x days / a specific date). When the time comes to work on a task, you will be reminded by the widget. In this widget you will be notified when a new task has been assigned to you (the task will be listed in My Work widget). Also, when other team members make comments to your tasks, the title of that task will appear in bold, so you can see that there has been some new activity. 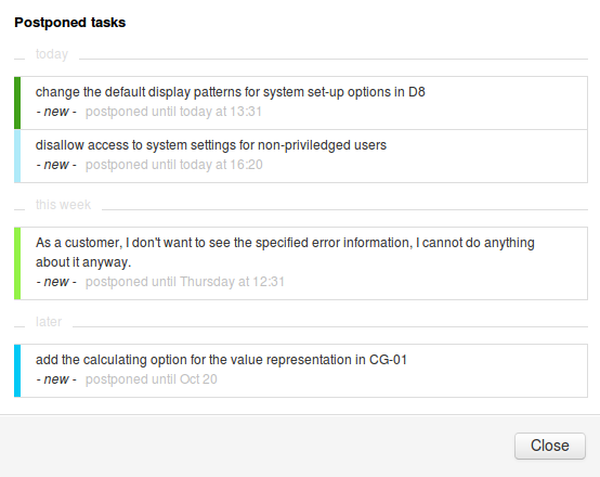 This is the feature, that enables you to use a number of Kanban boards efficiently and comfortably. Please take note, that this widget is only available to users that have enrolled to a pricing plan that includes Time Tracking and Time Report features (Unlimited and Enterprise plans). Switch to Enterprise or Unlimited pricing plan and start using My Work widget with Kanban Tool today.